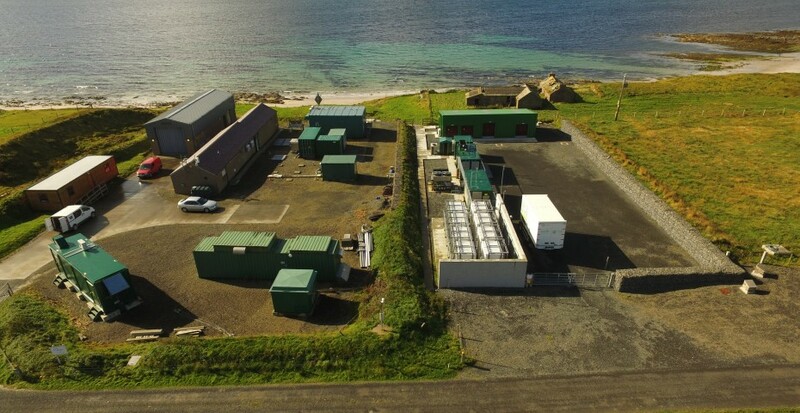 EMEC’s hydrogen production plant is located onshore at EMEC’s Caldale site on Eday in close proximity to EMEC’s grid-connected tidal test site at the Fall of Warness. 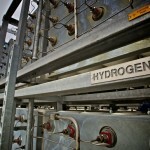 Producing hydrogen and using it as an energy storage medium is a solution to overcome local grid constraints, enabling large scale renewable integration. 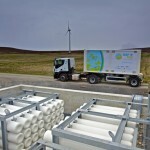 Orkney has become a leading example of a developing hydrogen economy and offers a demonstration site for new hydrogen technologies with EMEC supporting and actively collaborating on hydrogen research projects. 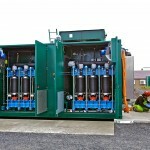 In 2016, EMEC installed a 0.5MW rapid response PEM (Proton Exchange Membrane) electrolyser in the laydown area adjacent to the substation to produce ‘green’ hydrogen from excess renewable energy produced by tidal energy converters testing at the Fall of Warness and from the 900kw Eday community wind turbine. In 2017 EMEC achieved the world’s first tidal generated hydrogen using power from tidal energy clients, Orbital Marine Power and Tocardo, which were testing tidal energy devices on site. Control switchgear inside EMEC’s substation determines whether the power fed to the electrolyser is to be routed from tidal generators testing at the Fall of Warness site or the community wind turbine. The electrolyser is housed in a standard 20′ by 10′ ISO container and can generate up to 220kg of high purity, fuel cell grade hydrogen per day. Hydrogen gas is produced via electrolysis at 20 bar which is then passed into a compressor to further pressurise the gas to 200 bar at which point it is stored. Up to 500kg of hydrogen can be stored in storage cylinders on site. 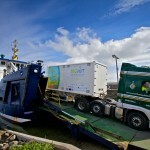 The hydrogen can then be transferred to specially designed mobile storage units (MSUs) and transported to the Orkney mainland by road and ferry. Each MSU can transport 250kg of hydrogen. The MSUs consist of 59 lightweight composite cylinders made of aluminium with a Kevlar wrap, specially designed to comply with road restrictions. The hydrogen is then used locally in a variety of fuel, power and heat applications in hydrogen technology projects. The hydrogen production plant is overseen by experienced maintenance and operation technicians with infrastructure regularly checked and tested. Safety is paramount and as hydrogen gas is flammable, it needs to be treated with care. Appropriate safety measures and procedures are in place on site to minimise any associated risk with all equipment designed to let gas safely disperse upwards into the atmosphere, were a leak ever to occur. The infrastructure on site has been tested to UK and European standards and regular safety inspections are carried out by EMEC to ensure equipment is operating correctly.